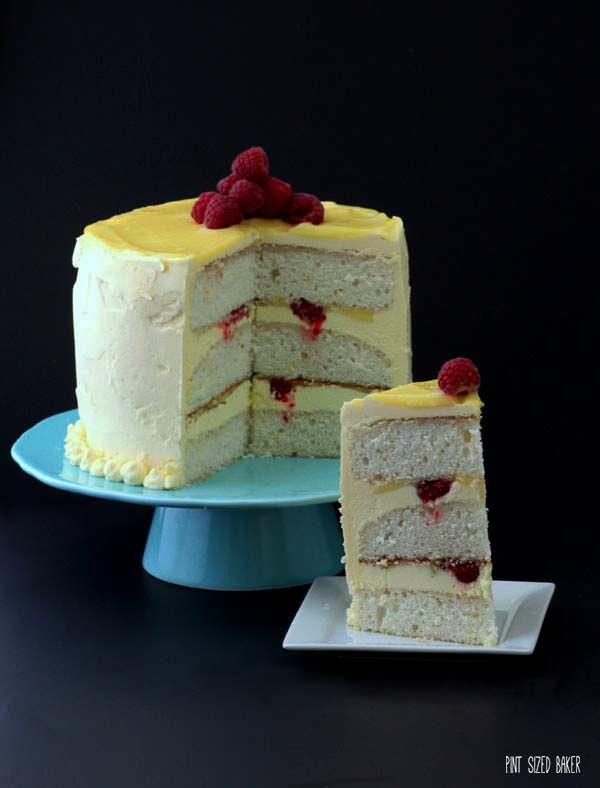 You’ll fall in love with this Raspberry and Lemon Layer Cake. 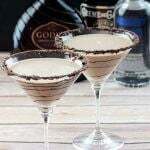 Bursting with sweet flavors that are perfect for any celebration. I made another cake that I am very proud of. 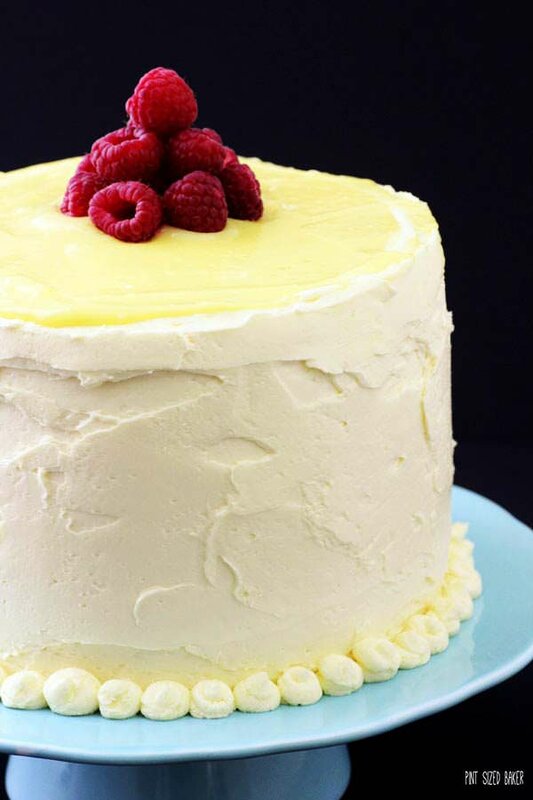 This raspberry and lemon layer cake is filled with lemon curd and fresh raspberries and it just made me so happy when I sliced into it! 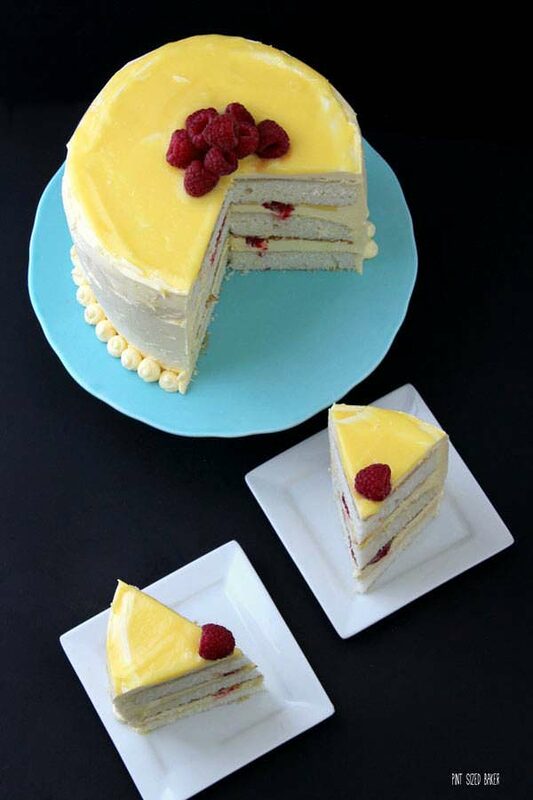 Three layers of sponge cake sprinkled with lemon simple syrup then there is more lemon flavor with the sweet contrast of the fresh raspberries. This cake does have a few extra steps, but they are all worth it and they all add the outstanding flavor of the cake! The frosting that I made was new to me. This buttercream is similar to the Swiss Meringue Buttercream that I made for my birthday cake, however, this frosting used whole eggs and not just the egg whites. The egg yolks gave the frosting a beautiful pale yellow color that I loved! It was just the perfect shade of happiness! And then to top that happiness with the bright lemon curd on top, was like watching the sunrise while on vacation. You know that feeling? You’re on vacation and anything is possible for the day. There are no plans, no times to be anywhere, no restrictions, just limitless possibilities… like going back to bed to snuggle with your better half. Man… I really, really need a vacation like that. But I digress…. Slicing into the beauty was fun. I thought I had added a lot of raspberries to the layers, but I guess I could have added a few more. I would like to point out the middle layer to you. In the post with the cake recipe, here, I discussed using the baking strips and pointed out the domed top of the third cake. Well, while preparing the cake, I had to make the cakes all the same diameter. I used a serrated knife to trim off the hard edge of the cake and make the other two cakes the same size. This also removed a lot of the nibble marks, not perfect, just reduced. In the photo above, you can see a noticeable slope to the middle cake and how much frosting I had to use to build up that layer to make a level area for the third cake to rest on. You can also see the darker line at the bottom of the middle cake. This is just from the darkening of the cake baked without the bake strips. 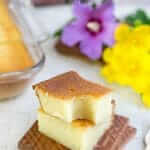 I hope that you try this cake. I ended up giving it to my lemon loving friend and he loved it! I think his family polished off this cake in one evening. 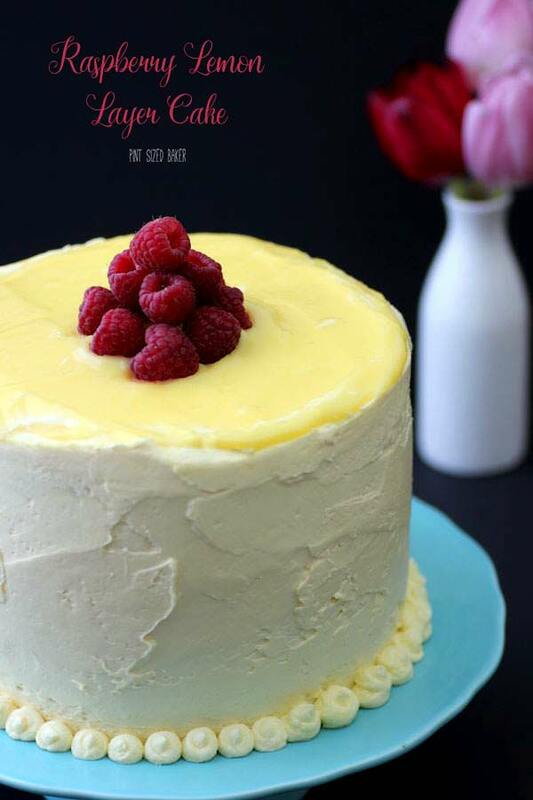 Lemon cake with lemon curd and fresh raspberries just scream out Spring to me! Stir the water and sugar together in a small pot over high heat. Bring to a boil and do not stir again. Heat the sugar to 238℉ (soft ball stage). While the syrup is cooking, whip your eggs and egg yolks until they are pale and light. When the syrup is ready, turn the mixer to low and very, very slowly add the syrup to the eggs. Allow it to drip down the sides of the bowl into the eggs. 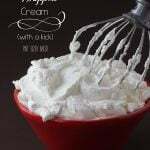 Increase the speed to medium and whip the mixture until the bowl is cool to the touch. This may take 5 minutes. Do not rush it. Reduce the speed of the mixer back to low and slowly add in the butter one Tablespoon at a time. Once all the butter has been added, increase the speed to medium and whip for another 5 minutes. It'll get pretty ugly before it gets beautiful. Finally add the salt and get the rest of the cake ready to be frosted. Divide the buttercream into two 3 cup bowls. Cover one bowl set to the side; add ½ cup of the lemon curd to the second one. Mix the lemon curd and frosting together. Add ½ cup of the lemon buttercream into a pastry bag. 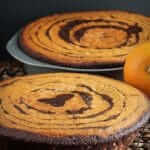 Place one of the cakes on a cake round or directly on to a cake platter. Brush on, or use a squirt bottle, about ⅓ cup of the lemon simple syrup. Be generous. Spoon 1 cup of the lemon buttercream on to the cake and smooth out. 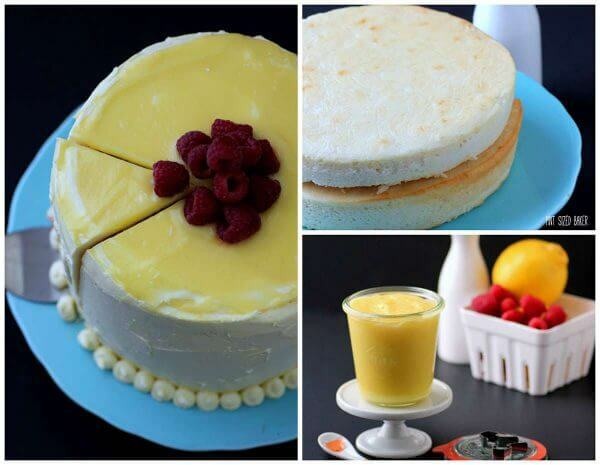 Add a frosting dam around the cake then fill in with ½ cup of lemon curd. Add in a few raspberries. Top with second cake. Repeat with the syrup, frosting, dam, curd and more raspberries. Top with the third cake upside down so that the edges are squared off. Add the simple syrup to the cake then add a thin crumb coating with any lemon buttercream remaining. Place into the fridge to firm up for 1 hour. Once it has firmed up, frost the cake with the reserved plain frosting. You may have to beat it a wooden spoon to smooth it out again if it separates. Frost and decorate as desired. I kept it basic and simple. Top the cake with ⅓ cup of lemon curd and a few pretty raspberries. Store in an airtight container in the fridge for up to 2 days (if it lasts that long). This recipe is part three of a three part series including a White Lemon Sponge Cake and Homemade Lemon Curd. Hahaha! We keep talking about a bakery, but I HATE working and I put so much pressure on myself when treats are for other people. It would totally stress me out and no longer be fun. How do you make the pearly balls at the bottom of the cake? The bottom “balls” are just dots of frosting. I used a small open tip and pipped them out. Love this! This is one of my favorite flavor combos and I have put this right to the top of the list for things-to-bake! Thanks so much. I hope you enjoy it as much as I did! It’s a large recipe, but if you break it down, it makes it a lot more manageable. Oh my! This is so beautiful and makes me excited for spring! You are a fabulous cake decorator. I would never be able to get a cake that pretty! Me too! Thanks so much for the compliment. I can frost a cake, but it takes me forever to do it. wow your cake is beautiful and looks delicious!! When you put a dam around the edges of the cake, did you use only buttercream or the buttercream mixed with lemon curd? Also just making sure, did you put a layer of buttercream first, then pipe the dam? And you mentioned melon buttercream, Where is the melon buttercream? And you said that you used the plain buttercream with out the curd mixed in to frost the cake, how did you get it the same color as the dam and filling? I love it, wish I could have a slice right now! A1 – I used the lemon buttercream to make the dam. I just put a half cup of the frosting into a piping bag and used that. A2 – Yes, lemon buttercream, dam, then curd. 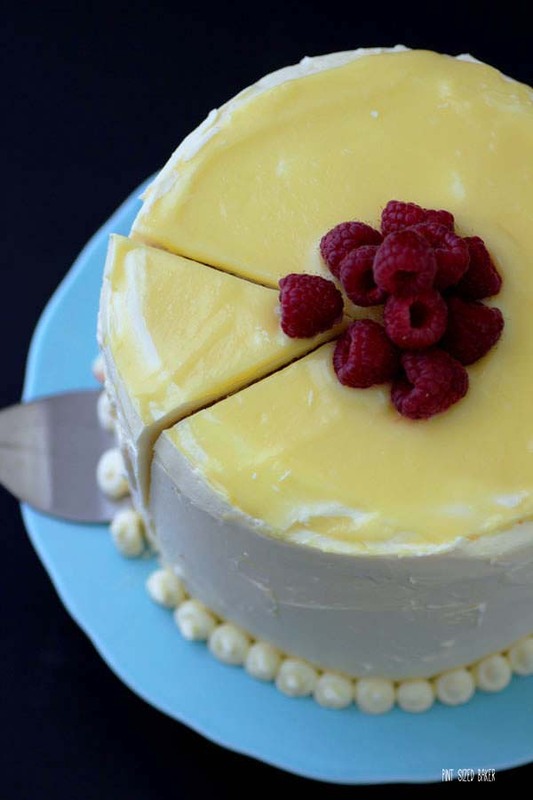 A4 – The buttercream is very yellow. 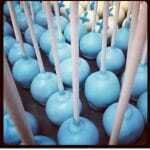 I didn’t see much difference in the color of the flavored vs. unflavored buttercream. With 6 egg yolks, it was a beautiful yellow color. I hope that helped. I loved it! ahhhhmazing! This cake makes me think of summer. I love anything raspberry and lemon. Great combo. Thanks! I can’t wait for Spring to brighten up my day! 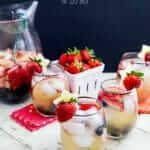 Will you be posting the simple syrup recipe? 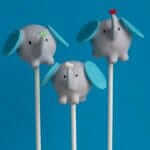 I can’t find it, and I’d love to make this for my mom’s birthday next month! Sorry, the syrup recipe is included in the cake recipe here. http://dietersdownfall.com/lemon-sponge-cake/ It’s just lemon juice, water and sugar. I hope that she enjoys it! oh my! what a gorgeous cake! thanks so much for the feature! I’ve just linked up again! Beautiful! I have a lemon loving sister-in-law and think this would be perfect for her birthday which is in a few days. My only concern is there will be both kids and elderly folks at the get together and I wanted to check the safety of the eggs being in the buttercream and if it would be safe for those folks. Thanks. Such talent. Thanks for stopping by. We loved the cake and frosting. You can buy pasteurized eggs if you are worried about eating raw eggs. Store bought eggs, when handled properly are generally safe to consume. It’s best to do your research make your own decisions. Slicing is always a pain when they are tall… It’s hard to get “small” slices and keep them looking pretty. Hello. Is this a hybrid buttercream? 🙂 I mean it looks like a combination of buttercream and SMBC only this is the first time I see SMBC with egg whites and whole eggs. Will it really work? Thanks for sharing… I must try this. Yes, it’s like a Swiss Meringue Buttercream and it turned out fantastic! I got the recipe from from the cook book Flour. It was new to me. It’s a wonderful cake. I hope you love it as much as we did! 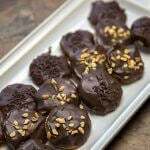 Uses regular granulated sugar in the frosting. You want to melt the sugar to a syrup and then whip it. It’s a cooked buttercream and it’s so good! !